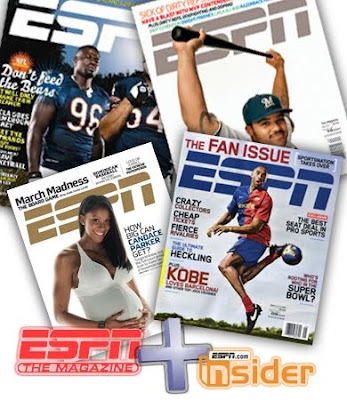 ESPN Magazine subscription for three years and all you have to do is pay the price of delivery. That is a deal bound to get anyone's attention. It got mine. With football season upon us, now is the perfect time for this deal. This football season is full of plenty of stories and man-style soap opera drama. Is Brett Favre too old? Mark Sanchez to young? Does Michael Vick need a dog muzzle? No, this isn't your run-of-the-mill soap opera drama. This is football drama - and it is exciting! Subscribe to ESPN Magazine with this short-lasting deal and get all the tidbits to satisfy your football needs. This deal also includes subscription to ESPN.com Insider. If you've ever browsed the ESPN website, you'd know that in their infinite glory, they now make you pay for access to certain parts of the website, calling it "ESPN Insider." When I see this when I'm browsing the site, I scoff at it. I wonder to myself "who's gonna pay for that?" Well ESPN is now offering this deal to give people a taste of the good life of being an ESPN insider. I'm gonna try it out. Who knows - if it's good - I may go for a lifetime subscription. In the meantime, I'll enjoy the free three year subscription. I suggest you do the same. These kind of deals don't come around often and there is a countdown to midnight when this deal ends. Hop on it! It's football season!